The University of the South Pacifics regional journalism programme marks its 10th anniversary this year. It is a milestone worth commemorating, the decade being one of progress and achievement. Not only has the programme survived longer than some had predicted, it has produced 76 journalism graduates between 1996 and 2003. THE University of the South Pacifics regional journalism programme marks its 10th anniversary this year. It is a milestone worth commemorating, the decade being one of progress and achievement. Not only has the programme survived longer than some had predicted, it has produced 76 journalism graduates between 1996 and 2003. A research paper released this year shows that between 1994 and 2002, more than 75 per cent of the graduates were absorbed by the regions news media. Entitled From Campus to newsroom in the South Pacific: Credible media career paths versus academic anaemia, the survey reveals that a diverse range of 29 media employers in nine Pacific countries have hired USP journalism graduates. The research paper was jointly written by the USP journalisms former coordinator, David Robie, and myself. The results are a vindication for the programme given that sceptics both inside and outside the university had questioned the need for, and the relevance of, an academic journalism programme. An external review of the programme carried out by Professor Mark Pearson, Head of Journalist at Bond University, Queensland, in April 2002 describes it as having an "excellent curriculum and high calibre staff". The report said that this, and a high international profile, had been achieved despite the programmes "weak positioning in the universitys organisational and budgetary structure". Shocking finding: But one of the shocking findings of the report is the preponderance of Fiji graduates - 67 per cent. This is unacceptable for what is supposedly a regional journalism programme. It highlights the need for the USP to make a genuine effort to ensure that the whole region benefits from the expertise and facilities available, including investing to market the programme in the region. The move would be in line with the USPs stated aim of promoting good governance in member countries, especially when the shortage of well-trained journalists around the region sticks out like a sore thumb. Growing acceptance: Initial scepticism aside, there is growing acceptance of the USP programme, with eight working journalists enrolling this year. The mainstream medias reluctance to hire journalism graduates, and the graduate journalists reluctance to take up mainstream media employment because of poor salary structure and working conditions, is another area that has seen a slight improvement, says the programmes outgoing coordinator of one year, Dev Nadkarni. He hopes this signals the beginning of a new era. French assistance: It was French foresight and funding that gave birth to the programme in 1994. Aware that journalists trained to ably carry out their watchdog role were needed in the region, the French Government thought it a worthy area to invest in. Under the founding coordinator François Turmel, a former BBC broadcaster, the programme had produced its first six double major graduates by 1997. Wansolwara, the programmes flagship quarterly publication, was founded in 1996 by volunteer journalism students. The lecturer at the time, Philip Cass, gave the newspaper its name. Wansolwara is a Solomon Islands pidgin expression that means "One ocean, one people". French funding ended in 1997, but the French have been, to this day, friends, supporters and benefactors of the programme. Breaking new ground: The USP took over after the French left, hiring New Zealanders David Robie from the University of Papua New Guinea as the coordinator and Ingrid Leary as the television and media law and ethics lecturer. In his five years, Robie, now a senior lecturer in the School of Communication Studies at the Auckland University of Technology, took the programme to new heights. He redesigned the newspaper, incorporating it as a compulsory component of student work, and introduced an online news service, Wansolwara Online and Pacific Journalism Online, with content provided by the students. With its own website and newspaper, the programme was way ahead of its time. 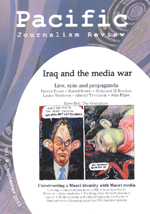 Many established journalism programmes in Australia and New Zealand have only recently set up websites and established newspapers. Robie considers multi-skilling  the equal teaching put into print, online, television and radio journalism  a core strength of the programme. "The reality is that Pacific journalists change their careers a lot and USP graduates are much better equipped for future developments in media convergence and in professionalism by being provided a good grounding in all major news technologies," he says. During Robies time, USP won more than10 prizes and highly commended citations at the annual Ossie Awards, conducted by the Journalism Education Association (JEA) of Australia, New Zealand and the Pacific. Practical training: The USP programme is practical orientated. Along with online and print news, students produce radio (Radio Pasifik) and television (Wansolvision) news. The six-week industry attachments for third-year students are also a valuable component of their practical training. The students were, accordingly, in the forefront of the May 2000 coup coverage. However, the programme faced its biggest test when the Wansolwara Online news service was shut down in the middle of the coup coverage by the then Vice-Chancellor, Esekia Solofa, for "security reasons". It gave rise to fierce debate inside and outside the university. Many international media groups, journalism schools, professors and academics wrote to the university urging for the website to be reopened. Said Murray Burt, president of the Commonwealth Journalists Association, at the time: "I have watched their [the students] writing closely. "For the most part it has been excellent - tempered, insightful, lawful and credible in its very closeness to the action. There has been a measure of bravery, too, which should not be forgotten when the dust settles." While USP academics such as Associate Professor in Economics Dr Biman Prasad supported the programme on the grounds of academic and media freedom, others felt that it had overstepped its mark by reporting on the coup because of the political connotations and safety risks to the student reporters and staff. Robie, at the time, said: "Any notion that journalism students shouldnt do real journalism is absurd. This is what journalism education is all about - integrated theory and practice on the job." 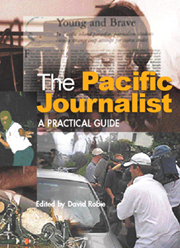 Pacific Journalism Online went on to win the coveted Dr Charles Stuart Award for best publication for its coup coverage in 2000. The programme has always tackled controversial topics head-on and aside from the coup; students covered the 1999 and 2001 Fiji general elections. Within the university, Wansolwara has reported and editorialised on overcrowding on campus, financial misconduct by the student association, free hikes, racism and good governance. Support for journalism: By and large, the university administration has been supportive of journalism and has respected its editorial independence. Students have regular access to the Vice Chancellor through four press conferences annually and the Journalism Advisory Committee, which comprises journalism staff, student reps and industry people is chaired by the Vice Chancellor. However, as noted by Dr Pearson, the relationship with industry has been "chequered". His report said that senior faculty supported the programme for bringing "kudos and energy to the [Literature and Language] Department" but most said it also "brought headaches and was an expensive area to support". Challenging future: Journalism does not have the numbers to be financially viable, which is a threat hanging over the programme. There is no guarantee that future administrations will support the programme or provide it with resources needed for development. Nadkarni is not the first to recommend that journalism break away from the Literature and Language Department and become a stand-alone programme as this would to give it the autonomy, flexibility and financial independence needed to set and achieve goals. He envisions journalism being part of a school of communications delivering several trade-based courses in both the artistic and technological sides of radio, television, film and new media. This would attract both the student numbers and teaching talent, addressing the present problem of lack of numbers. However, if such a plan is ever adopted, journalism has to ensure that it retains its independence and that the professional and ethical ethos of journalism are not diluted in any way. The programme was, after all, founded to train and equip journalists with the skills needed to effectively carry out their watchdog role in a democracy. This should remain its core function. Anthing else would be tantamount to betrayal. Copyright © 2004 David Robie and Asia-Pacific Network. This document is for educational and research use. Please seek permission for publication.